Recently we hosted a webinar and published a blog post on DAM for Retail. Digital Asset Management (DAM) helps retailers efficiently and timely provide personalised and consistent message to the ever-demanding customer. FMCG (fast moving consumer goods or CPG (consumer packaged goods)) stands just a step earlier in the supply chain involving manufacturers, sellers and marketers. Often FMCG is associated with brands and brand marketing. How can FMCG benefit from DAM? Each of these present specific challenges for FMCG brands. Success requires collaboration across the marketing – development – manufacturing value chain, combining the work of creative and technical. As a subset of DAM, brand asset management provides brand guidelines, online proofing and approval, automated workflow and marketing process management. For example, it allows to select assets approved for brand communication and put them in context. 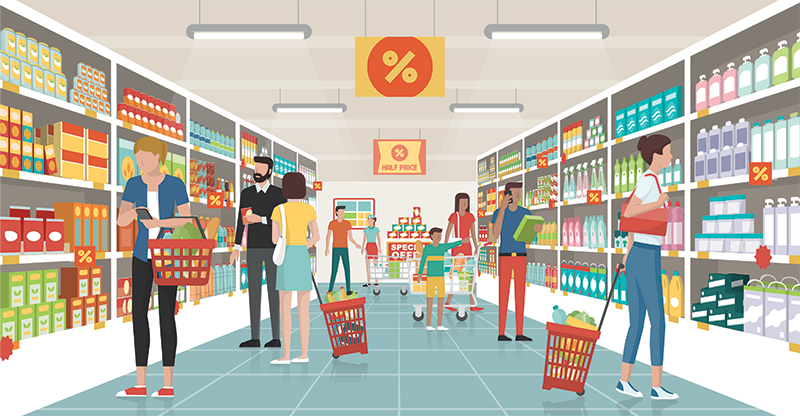 To get to the shelf first FMCG companies must have their creative ability across their brand management, marketing, and design teams maximised by continuous collaboration in real time, around the world. In an industry where getting your product on the shelf quickly is very important it is essential to get to your digital assets quickly and in an organised manner to make it easy for the members of the team to find the assets they need, when they need them, fast. A DAM solution can help create the required alignment of people, processes and digital assets in an efficient way by providing a central repository to create, organise, manage, archive, and distribute the media assets. Collaborate and share ideas with your outside agencies in real-time. Having all your assets in one place will help speed any changes that take place in the asset creation process. The key task for FMCG marketers is about getting their brand front-of-mind and setting themselves apart from the competition with a great product and even better creative marketing to increase product/brand awareness. To stay on top, their marketing message needs to move to an approach that relies on customer engagement, dialogue and collaboration. Focus less on what’s being sold, and more on the relationship between product and customer. According to eft only 3% of supply chain executives of retailers say “their technology fully supports their efforts to improve customer experience”. In particular, most suppliers are looking for multi-channel distribution of content to support their marketing processes, but are doing so by duplication of their efforts for each channel, whereas with a suitable DAM they will be able to have multi-channel distribution program without duplication. A digital asset management solution helps connect you with your audience through social media, ad campaigns, and other channels by allowing easy access and sharing of media files in the best format for print, web, or social media. With product as the fixed point the content circulates around, a digital asset management system keeps the content product-focused and on-point as it moves between different departments, companies and channels. DAM is instrumental to consistent marketing initiatives, product launches and content management efforts. In an industry where every dollar spent cuts into your bottom line being more efficient is paramount. Spending days looking for an asset for your next marketing collateral and taking months to approve the artwork just won’t work in your favour. Digital asset management solves these problems by offering one centralised repository for all your media assets, giving you control of the assets’ management process, allowing teams across the globe to collaborate in real time, and improving the overall marketing workflow. By leveraging DAM technology, FMCG companies can significantly reduce costs and decrease marketing material production time while increasing the quality of the finished materials. Brand and marketing managers must ensure everyone within the company or across the supply chain is working with current branding guidelines, labelling and product information as they produce or reuse company’s artwork. DAM provides self-service facilities (such as, Portals for Cumulus or Workspace for Flight) to distribute a small, approved subset of content to parties inside and outside a company that suits the style of asset delivery and consumption. A DAM system is much more than the organisation of digital assets. Through integrations DAM will work in sync with your other systems allowing for a much more efficient way of managing media assets and delivery of marketing content. You have control over who gets access to what files in your DAM system. Let authorised users within the company as well as authorised outside agencies access the materials and information they need to work on marketing materials around-the-clock across the globe allowing for better management and execution of their marketing efforts. Streamline and automate the marketing workflow processes while, at the same time, protecting your organisation from risk by ensuring legal and copyright compliance throughout the creating, storing, and distributing your media assets. With the help of DAM you can store your copyright information in metadata and make it searchable, protected and share-able without restriction. “We found we were getting multiple requests for files. It was using our designer’s time searching for the files, organizing them and then getting them to the end user. This was taking away from other projects the designers could be working on. From that perspective I believe, Cumulus DAM really has helped our organization- it just streamlined our processes,” – Peter Baltjes, Marketing Director at ACMG. Read the full case study here. Digital asset management solution will speed the development of new marketing materials while providing the means to manage change at all levels of creative process. Quick product lifecycles, intense competition, and low margins present challenges for FMCG. An agile and powerful DAM system will help keep up with businesses that move at lightning speed. Protect your brand and boost revenues by efficiently storing, organising, managing, and distributing your digital marketing assets. Look forward to catching up with you then.